The cold weather has remained with us at Loch Leven this past week and as a result the water temperature has remained steady at an unseasonably chilly 8.50C. However, the clarity has continued to improve and has now reached a very encouraging 3.5 metres which means light penetration is good – when the water temperature starts to rise, weed growth will be prolific and this is important for a wild brown trout fishery. Weed growth provides a good environment for the diverse food sources the trout feed on and also the weed tends to utilise the very nutrients that algae, ever present in the loch’s water column, would use. Some really nice fish have been caught over the last week at Loch Leven, topped by a lovely trout estimated at between 5-6 lbs which was caught and returned by Steve O’Neill. This fish was one of 6 fish caught and returned on Sunday by Steve and his boat partner Tony Black, the well known Tay ghillie. 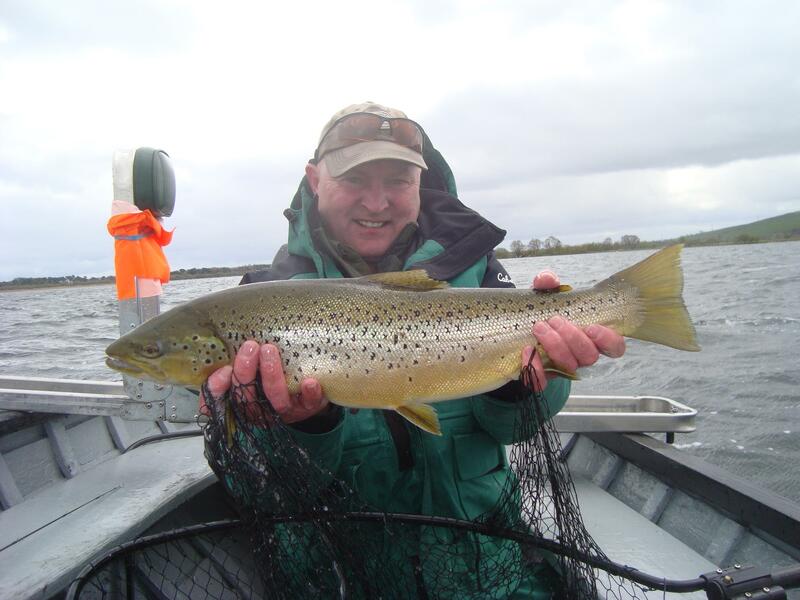 Steve commented “Loch Leven is the only place in Britain where you can pick up brown trout in the 4 & 5 lbs bracket on a regular basis. I had great few days this week on the loch – on Monday 23rd I released two trout around 4 lbs and yesterday I released the one in the photo we estimated to be 5 lbs plus”. Local anglers Donald McGregor and George Brown had 9 fish between them on Saturday – six weighed in at 12 lbs 11 ozs and the other 3 were returned. Robert Walls had 4 fish which were all returned whilst Mr Carr also caught 4 brownies, one of which weighed 2 lbs 10 ozs and the other 3 were returned. Fish were caught using the usual buzzer methods but also pulling a team of wet flies seemed to work well. The best wet flies were Kate McLaren, Black Pennell and the usual Dunkeld variants. Dark coloured (brown & black) buzzers seemed to be the most effective for those fishing that method. In the main, fish have been located well below the surface and therefore high density lines have been the order of the day. When using pulling methods, DI7 and DI5 lines appear to have been used by most anglers. Buzzers are being fished deep below a full floater or one of the main midge tip lines available. The Hole ‘o’ the Inch, Brock’s Hole, East Buoy, West Point of St Serfs and the area just north of Scart Island have been the most successful drifts over the last week. As the air and water temperature rises (surely it must soon! ), fly hatches will become much more prolific and, when they do, the loch will provide fish over a much wider area and the old anglers’ saying of ‘right place, right time’ will increasingly hold true.